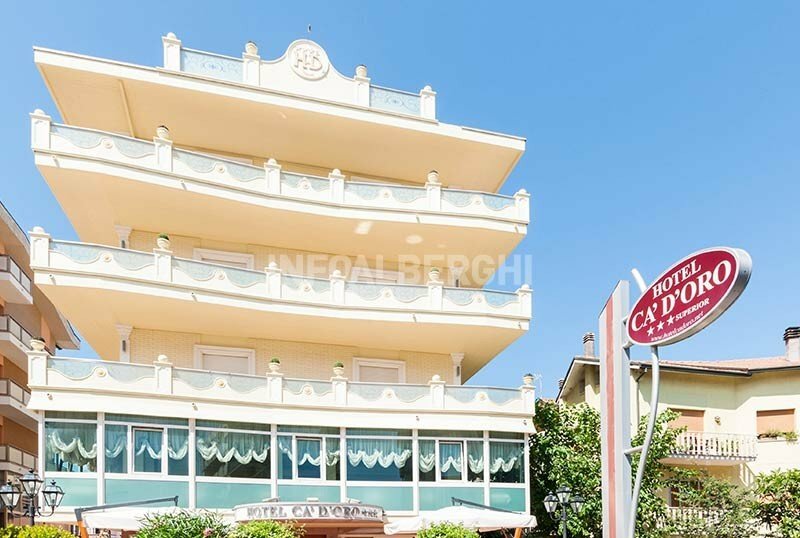 The Hotel Cà d'Oro , a 3-star superior hotel in Cervia, is family-managed, close to the sea and has free parking, WI-FI and a playground area for children. Adheres to AIC (the Italian Coeliac Association) and offers cuisine for celiacs with various and different menus every day. Admits animals of all sizes. The hotel is located in Cervia just a couple of minutes walk from the sea. All rooms have a bathroom with shower, hairdryer and complimentary toiletries, balcony (also with sea view), LCD TV, fridge, telephone, WI-FI, safe and air conditioning. Guests have free use of bicycles, satellite TV with Sky, lift, air-conditioned restaurant. AIR CONDITIONING: in the restaurant and in the rooms. BREAKFAST: sweet and savory buffet with croissants, cold cuts, cheeses, yoghurt. LUNCH AND DINNER: 3-choice menu with fish every day, buffet of appetizers, fresh vegetables, and side dishes. VARIATIONS: the hotel adheres to the Italian Celiac Association - AIC- and offers menus for coeliacs that are varied and diversified every day. Vegetarian and vegan menus on request. At meals: homogenized, baby food, baby menu, flexible hours, high chairs. Prices are per day per person for stays of minimum 3 days in full board.